Whip up a quick weeknight meal with this Black Bean and Ham Soup. With a little help from the store, this healthy and simple recipe can be done in no time! Weeknight meals can be a pain to prepare if you don’t plan ahead. 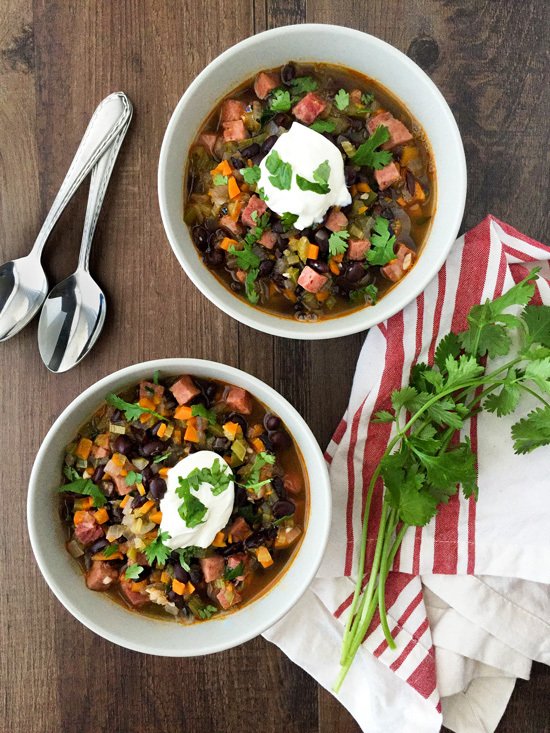 This Black Bean and Ham Soup comes together quickly with the help of canned beans. Of course, if you’ve cooked up a pot of black beans the weekend before, you can certainly use those instead! I usually cook my beans from scratch, but I do keep a few cans on hand for quick meals. The kind I tend to always have in my pantry are cannellini beans (white kidney beans) and black beans. Basically, if you keep your pantry and fridge stocked with a few key items, you can always whip up something to eat. I always have onions, garlic, celery and carrots on hand. They are the basis of so many dishes like this black bean soup. 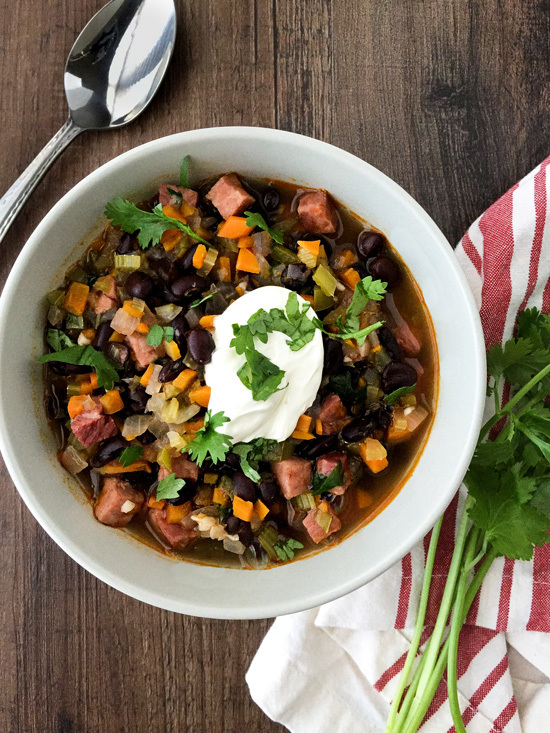 Of course, this Black Bean Soup recipe is also a good way to use up those ham leftovers during the holidays. With Christmas and Thanksgiving right around the corner, it’s great to have leftover ham recipes on hand. Speaking of which, my Ham and Pasta Salad is another delicious and easy way to use them! You’ll need about 1-1/2 cups of cubed ham for this soup. I bought an 8 oz. ham steak from Niman Ranch for my recipe. I’m not sure how many other stores carry this brand, but I get mine from our local Natural Grocers. 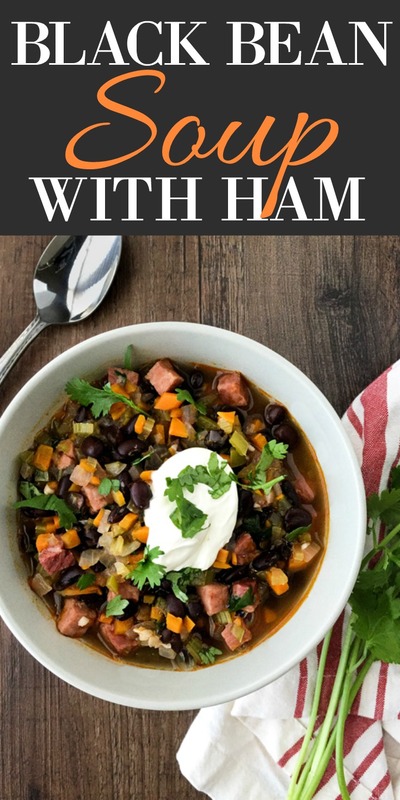 This Black Bean and Ham Soup recipe can be doubled to make a bigger batch if you need to feed more people. It makes about 4 main course servings. You can garnish it with your choice of toppings. I served mine with sour cream, but you could also add monterrey jack cheese, scallions or some tortilla strips. Tip: You can also serve this over rice to stretch it. I didn’t have quite 2 full servings ( my hubby had seconds!) the next day, so that’s exactly what I did. 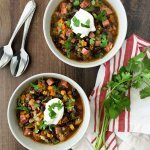 With the help of canned beans, this Black Bean and Ham Soup comes together quickly and makes a tasty meal. Heat oil in 4-qt. soup pot or dutch oven over medium-high heat. Add the onion, carrot, celery and 1/8 tsp of fine sea salt, and let cook, stirring occasionally, until veggies have softened and are lightly browned, about 10-12 minutes. Reduce the heat to medium-low, add the garlic, smoked paprika and cumin and let cook, stirring constantly, for another minute. Stir in the chicken stock, beans and ham, bring to a simmer and let cook, stirring occasionally, for about twenty minutes. Check seasonings, adjust if necessary, then serve topped with your choice of toppings.